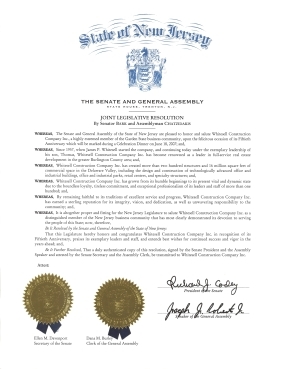 The Senate and General Assembly of the State of New Jersey recognized Whitesell Construction Co., Inc.'s Fiftieth Anniversary with a Joint Legislative Resolution honoring the firm as a distinguished member of the NJ business community on June 18, 2007. The Resolution honored Whitesell Construction Company's "growth from its humble beginnings to its present vital and dynamic state due to boundless loyalty, tireless commitment, and exceptional professionalism of its leaders and staff", "its traditions of excellent service and progress", and "sterling reputation for its integrity, vision, and dedication, as well as unwavering responsibility to the community". We thank New Jersey State Senator Martha Bark and Assemblyman Larry Chatzidakis who both represented the 8th Legislative District (1997 - 2008) for presenting the Ceremonial Resolution which commemorated this important milestone at our firm.